We are engaged in offering a premium quality assortment of Marriage Hall Cooling Service to our patrons. Due to our huge expertise in this work zone, we have come up with a broad range of Cooling Services. We properly deliver the required services within a definite time period. Making use of superior class modern techniques of cooling, these services are usually appraised. 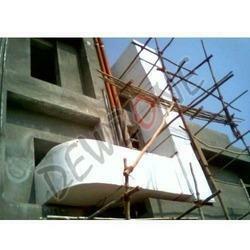 Our company holds vast experience in this domain and is involved in offering Air Cooling Service. Owing to our vast domain experience and knowledge, we are offering Air Cooling Chiller. The provided array is designed using quality tested material and contemporary manufacturing techniques at our vendors’ up-to-date production unit. In order to satisfy the diverse demands & requirements of a huge number of customers, we are providing an elite assortment of Air Conditioning Solutions. These services are executed by our team of inspired personnel who have enormous experience in their respective domain. The provided services are executed after evaluating the necessity of customers and providing them exact facility. One Stop Interior Pvt. Ltd.
We are the best services for servo stabilizers, then we provide good service for customer any time and any where. We have full power spares for air cooled stabilizer. We also provide AMC's for stabilizer based on customer wish. Blast Freeze/Pre-cooling: We provide Blast Freezing service for various foods such as Poultry products, Fruit Pulps and Juices, Sweet Corn etc. We also provide commercial pre-cooling facility for various fruits and vegetables as required. Leveraging upon our knowledgeable team of professionals, we are accomplished to offer a quality series of Air Cooling and Ventilation Contractors.